(Nanowerk News) Fishermen would be puzzled if they netted only big and little fish, but few medium-sized fish. Astronomers likewise have been perplexed in conducting a census of star-hugging extrasolar planets. They have found hot Jupiter-sized planets and hot super-Earths (planets no more than 1.5 times Earth's diameter). These planets are scorching hot because they orbit very close to their star. 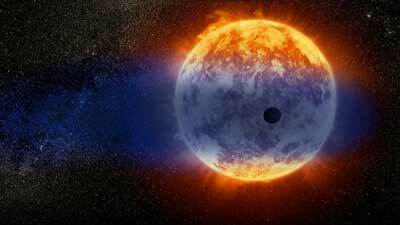 But so-called "hot Neptunes," whose atmospheres are heated to more than 1,700 degrees Fahrenheit, have been much harder to find. In fact, only about a handful of hot Neptunes have been found so far. In fact, most of the known Neptune-sized exoplanets are merely "warm," because they orbit farther away from their star than those in the region where astronomers would expect to find hot Neptunes. The mysterious hot-Neptune deficit suggests that such alien worlds are rare, or, they were plentiful at one time, but have since disappeared. A few years ago astronomers using NASA's Hubble Space Telescope found that one of the warmest known Neptunes (GJ 436b) is losing its atmosphere. The planet isn't expected to evaporate away, but hotter Neptunes might not have been so lucky. Now, astronomers have used Hubble to nab a second "very warm" Neptune (GJ 3470b) that is losing its atmosphere at a rate 100 times faster than that of GJ 436b. Both planets reside about 3.7 million miles from their star. That's one-tenth the distance between our solar system's innermost planet, Mercury, and the Sun. "I think this is the first case where this is so dramatic in terms of planetary evolution," said lead researcher Vincent Bourrier of the University of Geneva in Sauverny, Switzerland. "It's one of the most extreme examples of a planet undergoing a major mass-loss over its lifetime. This sizable mass loss has major consequences for its evolution, and it impacts our understanding of the origin and fate of the population of exoplanets close to their stars." As with the previously discovered evaporating planets, the star's intense radiation heats the atmosphere to a point where it escapes the planet's gravitational pull like an untethered hot air balloon. The escaping gas forms a giant cloud around the planet that dissipates into space. One reason why GJ 3470b may be evaporating faster than GJ 436b is that it is not as dense, so it is less able to gravitationally hang on to the heated atmosphere. What's more, the star hosting GJ 3470b is only 2 billion years old, compared to the 4-billion- to 8-billion-year-old star that planet GJ 436b orbits. The younger star is more energetic, so it bombards the planet with more blistering radiation than GJ 436b receives. Both are red dwarf stars, which are smaller and longer-lived than our Sun. Uncovering two evaporating warm Neptunes reinforces the idea that the hotter version of these distant worlds may be a class of transitory planet whose ultimate fate is to shrink down to the most common type of known exoplanet, mini-Neptunes--planets with heavy, hydrogen-dominated atmospheres that are larger than Earth but smaller than Neptune. Eventually, these planets may downsize even further to become super-Earths, more massive, rocky versions of Earth. "The question has been, where have the hot Neptunes gone?" said Bourrier. 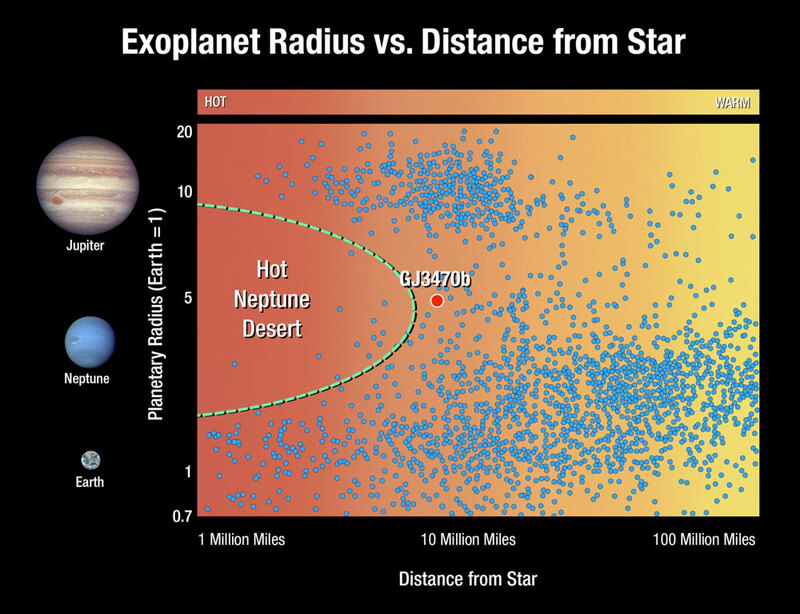 "If we plot planetary size and distance from the star, there's a desert, a hole, in that distribution. That's been a puzzle. We don't really know how much the evaporation of the atmospheres played in forming this desert. But our Hubble observations, which show a large amount of mass loss from a warm Neptune at the edge of the desert, is a direct confirmation that atmospheric escape plays a major role in forming this desert." The researchers used Hubble's Space Telescope Imaging Spectrograph to detect the ultraviolet-light signature of hydrogen in a huge cocoon surrounding the planet as it passed in front of its star. The intervening cocoon of hydrogen filters out some of the starlight. These results are interpreted as evidence of the planet's atmosphere bleeding off into space. Hydrogen probably isn't the only element evaporating away: it may be a tracer for other material streaming off into space. The researchers plan to use Hubble to hunt for elements heavier than hydrogen and helium that have hitched a ride with the hydrogen gas to escape the planet. "We think that the hydrogen gas could be dragging heavy elements such as carbon, which reside deeper in the atmosphere, upward and out into space," Bourrier said. However, helium is another tracer for material escaping a warm Neptune's atmosphere. Astronomers could use Hubble and the upcoming NASA James Webb Space Telescope to search in infrared light for helium, because it is not blocked by interstellar material in space. "Looking for helium could expand our survey range," Bourrier said. "Webb will have incredible sensitivity, so we would be able to detect helium escaping from smaller planets, such as mini-Neptunes."